Why do I want to fit a Dastek Unichip? In order to obtain more power from your engine. It often seems that as the power output begins to increase the limit of the stock ECU is found. In order to extract a little more power and to ensure that the car runs a little safer then controlling the fuelling and timing becomes increasingly more important. E.g. With a 205 at 1.2 bar on a stock turbo the car seems to over fuel and runs ~10.5:1 AFR on full boost. Leaning the fuelling out a little will help to raise power output. What's the benefits in fitting one? This is a cheaper alternative than fitting a fully programmable ECU, but the adjustability is limited. This is a piggy back ECU so the stock ECU functionality is retained i.e. In short the car runs and drives just like a stock car with no dramas with stalling etc. 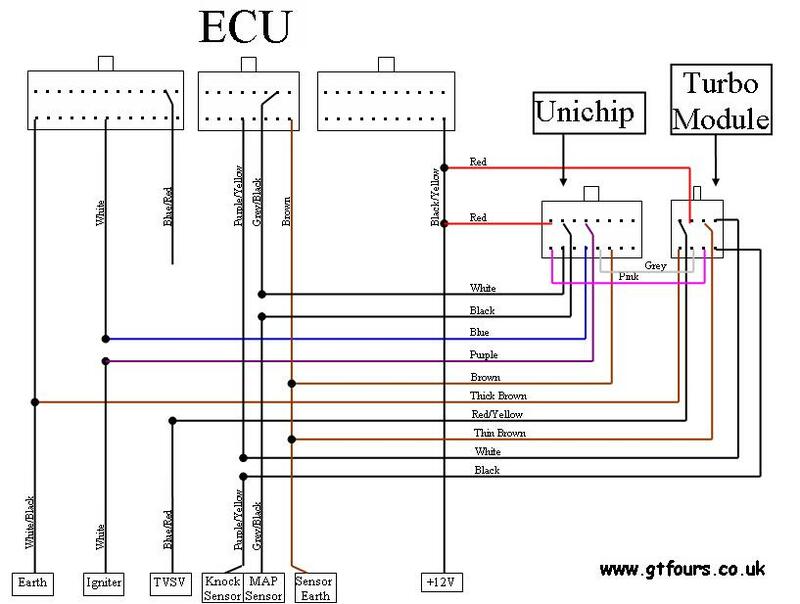 The piggy back ECU is not programmed with a laptop and therefore a tuning specialist is required, (read ££'s). If you change something then it's back to the specialist for more tweaking. The adjustability is limited as previously mentioned, so for example fitting larger injectors (540's) into a 165 or 185 will not produce startling results. For this I'd humbly recommend a fully adjustable ECU. Ok, what's the wiring diagram? Note this diagram is specific for the 205, but the wiring can be adapted to suit the 165 and 185. This article is intended as a helpful guide and shows how to wire up a Dastek Unichip. Note that this unit(s) require to be setup by a competent specialist with the relevant technical equipment. Fitting a Unichip and/or boost module is done at your own risk, incorrect tuning and operation can/will damage your engine.